Historically, Canada's nominees for best foreign-language film at the Oscars have included pictures in Arabic, Hindi and Inuktituk. That's got to be confusing to Academy voters. Voting members of the Motion Picture Academy of Arts and Sciences could be forgiven for wondering what exactly qualifies as Canada’s official languages. While the Quebecois cast members speak French, the sound of Arabic is arguably more prominent in Denis Villeneuve’s film Incendies, which is angling for best foreign film at the Academy Awards ceremony on Feb. 27. A screen adaptation of Wajdi Mouawad’s acclaimed play, Incendies was principally shot in Jordan and is Canada’s fifth-ever contender in this Oscar category. Canada’s last cinematic export to find a place among the five foreign-film nominees was Water (2006) — and the primary language was Hindi. It was appropriate, given that director Deepa Mehta set her drama in the Indian holy city of Varanasi. And of the last 10 films Canada has submitted for consideration in the category, two of them – Atanarjuat: The Fast Runner (2001) and The Necessities of Life (2008) – featured lead characters who spoke only Inuktituk. Every year, Canada is one of dozens of countries that submit features for consideration in the hopes that the Oscars may bless them with international exposure. For one nation to boast such linguistic diversity, however, must be confusing to the Academy voters responsible for determining the finalists. The one language those voters are unlikely to hear in a Canadian film is English. That’s because the Academy limits the foreign-film category to non-American productions that primarily contain non-English dialogue. 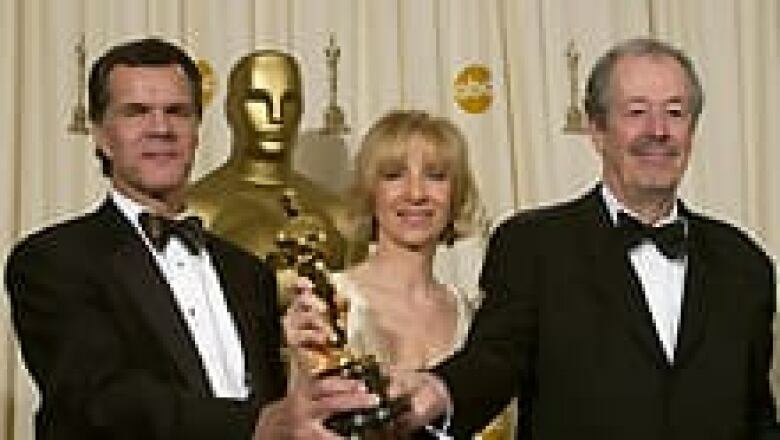 Though insufficiently "foreign," Anglo-Canadian features have been recognized in other Oscar categories – like Atom Egoyan’s The Sweet Hereafter, nominated for Best Director and Best Adapted Screenplay in 1998, and Sarah Polley’s Away From Her, nominated for Best Actress and Best Adapted Screenplay in 2008. Given that restriction, it’s no surprise that the overwhelming majority of Canada’s submissions for the foreign-language category over the last 30 years have been Francophone features made in Quebec. The description also applies to the one Canadian feature to ever win that particular honour. Edging out dimly remembered rivals like Evil (Sweden) and Twin Sisters (the Netherlands), The Barbarian Invasions won the Oscar for best foreign-language feature in 2004. It was the third appearance in the category for director Denys Arcand, after nominations for The Decline of the American Empire (1986) and Jesus of Montreal (1989). Incendies is up against more formidable competitors than The Barbarian Invasions was in 2004. The one to beat this year is Biutiful. A Mexican production set in Barcelona, the drama also earned a nomination for Javier Bardem, himself no stranger to the Oscar ceremony after best-actor nods for The Sea Inside and Before Night Falls and a win for No Country for Old Men. Biutiful director Alejandro González Iñárritu also received several nominations for his multilingual ensemble drama Babel. Two of the other filmmakers in this category are returning nominees. Previously nominated for After the Wedding, Danish filmmaker Susanne Bier makes a second appearance with In a Better World, a drama about a doctor facing conflicts both at home in Denmark and abroad in an African refugee camp. A Paris-born actor and filmmaker of Algerian descent, Rachid Bouchareb is back with Outside the Law, a crime saga set against the backdrop of the Algerian independence movement. The film features much of the same cast as Days of Glory, Bouchareb’s 2006 picture about North African soldiers fighting on behalf of France in the Second World War. Even if Villeneuve doesn’t walk away with the shiny statuette, he can take solace in the knowledge that Incendies has already been judged worthier than many other movies that have earned wide acclaim and major prizes over the past year. Among the official submissions that didn’t make the final five: the French drama Of Gods and Men; the Chinese blockbuster Aftershock; and Uncle Boonmee Who Can Recall His Past Lives, the Thai film that won the Palme d’Or at Cannes. In fact, Incendies has already earned something more valuable than any prize, especially for a Canadian feature — a U.S. distribution deal with Sony Pictures Classics. The company that made art-house hits out of films like An Education, The Lives of Others and The Secret in Their Eyes is set to release Villeneuve’s film in April. A politically themed mystery from Argentina, The Secret in their Eyes managed to pull off an upset in last year’s foreign-language category at the Oscars, trumping better-known critical faves like The White Ribbon and A Prophet. It also bears a great resemblance to Incendies. Both films use an investigation into their characters’ past to show how the traumas of war and violence influence the present. Alas, that’s a story that’s widely understood, regardless of the language in which it’s told.